Hello, my Gates cousins and anyone else who is reading this. This is the first installment of my geneablog. I hope you find it interesting. The photo on the left is that of John N. ROBERTS (photo from The Castle Tea Room). He's our great, great grand uncle. He was the younger brother of our great, great grandmother, Lucinda Frances ROBERTS , aka Frances L. GORTON in her older years (photo on right). She was born in Warren, Trumbull County, Ohio in 1826 and he was born 12 miles away in Mecca, Trumbull County, OH, 12 years later, in 1838. Thanks to Jocelyn (and her superior search skills) who found the first information on John N., I have ordered his probably riveting book, Reminiscences of the Civil War (which he wrote in 1925, at age 87) to see if he speaks of his (our!) ancestors in it. I am hoping to find a lot about John N. because he is my link to Lucinda's, and my, (and your, my Gates cousins) ancestry. 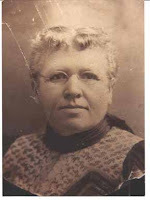 In case you've forgotten, Mary Augusta GORTON (married as MYERS) was our grandmother's mother, and Lucinda Frances ROBERTS (married as GORTON) was Mary Augusta's mother. All oriented now? Before I speculate about our probable second Patriot in the family, I am waiting to find out for sure who John N. says (in his book) his grandfather was. John N. states (in an excerpt from his book) that his grandfather ROBERTS was a Revolutionary Patriot but does not give his first name and I can find no identifying record of his grandfather's marriage or birth of his children...yet. John N. and Lucinda's father was a John ROBERTS who was born "near Hartford," CT around 1800, according to John N.'s book and OH census records. John marries, at age 22, Emaline HOTCHKISS, from New Haven, CT in 1822, in Gustavus, Trumbull County, OH. We have a copy of this record. #3. born 1762, from VT, with service in VT, MA and CT, with wife Margaret MERRILL. I found out some more about the William Roberts whose wife is Margaret Merrill. He was born in 1762, in West Simsbury (now called "Canton"), CT (William, the Patriot, was born "near Hartford" says John N.'s book excerpt) and he moves to Gustavus, OH after the war where he dies in 1833. "Gustavus"- doesn't that ring a bell? John N. and Lucinda's parents, John Roberts and Emaline Hotchkiss get married in Gustavus in 1822. The fact that John and Emaline are from CT but get married in Gustavus, OH and John's father, named Roberts, was a Patriot, and there is a Roberts patriot who moves from CT to Gustavus, OH makes me think this William is the ancestor I am looking for. It would make sense that a son of 22 would follow his parents from CT to their new home in OH and take his girlfriend and then get married there. How likely is it that more than one John Roberts left CT and moved to Gustavus? Well, there could have been two John Roberts if a large group of related Roberts family members all went together, so I'll wait until I have some proof before I say I'm sure. I suspect that maybe this was bounty land. Must do some more historical sleuthing. Was Ohio part of bounty lands given to Rev. War patriots? Where's a historian when you need one? Luckily, when William Roberts, the Patriot, died, his wife, Margaret, had to file many papers to get his pension transferred to her. One record is an affidavit, in 1839, from her, stating that she has no record of her marriage (married 1785, in Granby, CT) nor of the birth of her children...the children she doesn't list! John N. Roberts was an interesting character because after serving in the Civil War, he moved to Lawrence, KS where he built a house of stone that looked like a castle. (See "story" at The Castle Tea Room). He even went to Hawaii and back at the age of 89, right before his death. John N.'s only daughter Isabel Brandon ROBERTS, "Belle", married, first, Herbert ARMSTRONG of Topeka, KS, then second, Mark OTIS, of Chicago. When Mark died of the flu in 1918, John N., his wife Emily (SUTLIFF), and his daughter Belle moved to San Diego, California, to start life anew. Belle was born in July 1870 and died in March 1970 in San Diego, a few months short of 100 years old. Longevity! Unfortunately, I have found no record of Belle having any children. John N. Roberts refers to his earliest Roberts ancestor as a "Major ROBERTS, from the Scottish Highlands," who was in the British Army and came to Connecticut in the 1600's. So cousins, if he's right, we're Scottish! Jocelyn says the Roberts/Robertson name has a plaid so get ready for the kilts! More on John N. Roberts when his book comes all the way from a Kansas library to me on interlibrary loan. And then more on his grandfather, William the Patriot, I hope. What do you think about this latest addition to our family? I think that you can comment on this page at the bottom so you don't have to return email to everyone.